Tag line: "A long time ago in a galaxy far, far away..."
As a kid, I had Star Wars memorabilia in just about every corner of my room, from the ships (my favorite was the Millennium Falcon) to the hundreds of Kenner-manufactured figurines. The Star Wars universe was an enormous part of my adolescence, and from the looks of it, fans of the series are only getting younger! 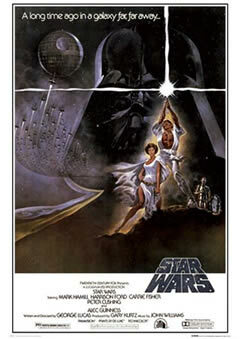 Star Wars was the first film released in what has easily become one of the most successful franchises in motion picture history. Now referred to as Episode IV: A New Hope thanks to the 3 prequels, Star Wars is the story of Luke Skywalker (Mark Hamill), an orphan raised by his Aunt (Shelagh Frasier) and Uncle (Phil Brown) on the remote desert planet, Tatooine. Luke knows very little about his father, except that he was once a member of the Jedi Knights, masters of a powerful energy known as The Force and, at one time, the guardians of the universe. That is, until the Jedi were overthrown by the evil galactic empire. To restore peace to the galaxy, a small rebel army has stolen the plans to the Empire’s lethal new space station, the Death Star. Princess Leia Organa (Carrie Fisher), herself a leader of the rebellion, was returning to base with these plans when her ship was intercepted by an Imperial cruiser. She's taken prisoner by Darth Vader (David Prowse, with the voice of James Earl Jones), the Empire’s most fearsome agent, yet before her capture, the Princess hid the plans inside a droid, which escaped to Tatooine where it eventually found its way to Luke. With the help of former Jedi Obi-Wan Kenobi (Sir Alec Guinness) and a wisecracking space pirate named Han Solo (Harrison Ford), Luke intends to rescue the princess and deliver the plans to the rebel base, all while learning the lost art of the Jedi. It’s a simple story of good vs. evil, one that's been told thousands of times before, and maybe even thousands of times since. Yet the drawing power of Star Wars lies not in the tale, but the telling. Never before had audiences seen special effects this spectacular, and despite the fact they’re now somewhat easy to duplicate, the magic of watching a huge spaceship fly overhead has never been quite as awe-inspiring as it was in Star Wars. Everything about this movie was done on a grand scale. Even Darth Vader is a step above the typical nemesis; part-man/part-machine, yet 100% villain. With alien races from hundreds of worlds, incredible spaceships that leap from one end of the galaxy to the other in the blink of an eye, and a magical force to watch over our heroes, this ‘simple’ story known as Star Wars has become something much more substantial. Unlike most movies decades old, the fan base for Star Wars has actually grown younger. Kids today, some of whose parents were in preschool when this film was first released, are as knowledgeable of the Star Wars universe as the series’ oldest and wisest fans. Both my sons are full-fledged fanatics, and own as many toys as I once had, if not more. While some things have changed over the years (The white-clad Storm troopers, the army of the Empire, somewhere along the line became known as Clone troopers), the hold these movies have on our culture has never diminished. Star Wars has gone beyond mere entertainment to achieve a greater cultural significance. Like Mickey Mouse, Bugs Bunny and The Wizard of Oz, Star Wars promises to be around for a long, long time. BEST FILM EVER and perfect for children!